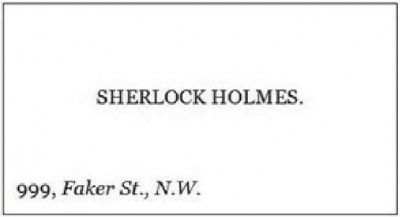 Ideal Interview V. Sherlock Holmes is a Sherlock Holmes pastiche written anonymously by "Anyhow" published in The Bohemian magazine in october 1893. Sometimes when the worries of my professional career are most severe, I find comfort in the philosophy of the ancients. Shortly after experiencing the dreadful adventures I am about to relate, I suffered from severe depression of spirits. Then I took refuge in Homer. Into the Sixth Book of the Odyssey I dived and read the beautiful account of how Ulysses disturbed the water picnic of the daughter of Alcinoüs. Some words the lady said to him soothed and comforted me. Briefly, they were to the effect that Zeus gives to every man his fair share of beer and skittles. Though to some interviewers are given the boudoir of beauty and the easiest chair in the club smokingroom, and to others come "moving incidents of flood and field," or "hairbreadth 'scapes i' the imminent deadly breach," yet for the most illused there is a good time coming. Or else Nausicaa didn't speak the truth. Having thus eased my mind and indicated my Culture, let me take up the thread of my narrative. I left off last month in the grounds of the Crystal Palace. How difficult it is to bring one's mind back to the past, to recall the dim half-forgotten horrors of that night. I must, however, be bold. As I was saying, I left the grounds and proceeded to the station. A vast concourse was assembled on the departure platform, and as each train went off, the guards, policemen, and attendants picked up the dead bodies of those who had been killed in the rush, threw them upon barrows, and they were taken away for immediate burial. Thinking it would be a pity to waste myself in a similar manner, I addressed an official, and offered him untold gold to procure me a carriage. Calling a few of his companions he made a desperate sortie as the next train came in, pushed me through the window to avoid unlocking the door, and stood in front of the compartment saying I had measles. I shall never forget the fiendish faces of the baffled protectors of Propriety when they saw me with a carriage to myself. Fortunately, just as a Socialist orator was suggesting that no single man ought to be allowed to stand in the way or monopolise the carriage of the masses, and that I ought to be instantly shot, the train moved off, and entered the Cimmerian gloom of the tunnel. Half way through the engine driver recollected to turn on the electric light, and as its brilliant rays pierced the darkness I saw, to my astonishment, that I was not alone. In the corner opposite to me lounged a pale, thin man, with two lovely black eyes and long bony hands. A violin case was by his side, and the cruel, cynical, callous, bloodhound, sleuthhound, bayhound expression of his countenance quickly dismissed my first impression that he was another of the advocates of abstinence gone wrong. "You are wondering how I came here?" he said interrogatively. I was startled, but murmured that such was the case. "Only another attempt to escape from the commonplaces of existence," he said wearily. "I have been in the neighbourhood to consult Dr. Donan Coyle about the abnormal development of my bump of mendacity. I was tempted into the palace. I was faint and bought a bath bun and a glass of milk. The price was twentyfive shillings. That cleared me out of ready money, and as I had not taken a return ticket, I had to lie perdu under the seat until the train started. I came through the lamphole. I have now made a long speech, so don't talk to me any more." He leaned negligently back, drew from his pocket a short black clay pipe, and started smoking as foul a concoction of shag as ever offended mortal nostrils. "Sir," I said firmly, "this is not a smoking carriage, and permit me to say that no human being could have entered it as you profess to have done. I must ask the guard to remove you or your pipe at the next station." My visitor's eyes flashed fire. "You doubt my word," he hissed. "Now, sir," he went on, "do you persist in doubting that I came through the lamphole," and quicker than thought the glittering barrel of a revolver stood in a straight line with my head. "Under the circumstances I withdraw my remarks," I said as cheerfully as I could. He laughed — the hollow laugh of a fiend. "It is well," said he, triumphantly, "but who are you?" I gave him my card, he glared at it and threw it out of the window. "I don't require any card to tell me who you are, Anyhow. I have known it all along," he said gravely. Seeing he had asked for the card and looked at it, I was of course duly impressed by the wonderful perceptive powers of the famous detective, and congratulated him upon them. "I am glad you appreciate me," he cried. "Do you know, Anyhow," he went on, as the whistle of the train shrieked shrilly, "do you know what that sound indicates?" "We are travelling at half a mile per hour, and the exertion is killing the engine," was Mr. Holmes' solution of his own puzzle. "How do you know that?" I asked innocently. "It is too simple to require an explanation," said the detective, and he fingered his revolver angrily. I did not say anything more, but left him to the comfort of the clay pipe; but as the train "dragged its slow length" along the Battersea platform, and I was ready to alight, he had resumed his quarters under the seat, and from the coign of vantage, with the revolver pointing at me, he exacted a promise that I would call and interview him on the following morning at 10 o'clock at Faker Street. When I had given him my solemn assurance the weird face was illumined by a smile of satisfaction, the six-shooter was withdrawn, and an audible chuckle followed me out of the smoky railway carriage. All that night I spent writing the account of my interview with Mrs. Grundy and my last will and testament. A few hours of broken rest, a hurried breakfast, and I took train to Victoria, and a cab to Faker Street. I pressed an electric bell, the door opened. A piece of string tightly stretched from the lamp, hung in front of me, and the instinct of self-preservation suggested prudence. Accordingly I stood back from the door, and threw my walking stick against the string. Instantly there was a deafening crash, and the contents of a huge coal scuttle fell heavily upon the ground. The string had kept it in position, and it was evident that the famous detective had prepared the little surprise for me. I proceeded cautiously up the stairs and knocked at the door of his sanctum. Sherlock Holmes in propria persona and his dressing gown instantly appeared, with a bottle of embrocation in his hand. Scarcely glancing at me he said, "You have met with a slight accident, but this is excellent for bruises." "Pardon me," I replied, "I am not in need of any embrocation. Listen to me," I went on, emboldened by the look of blank amazement on his face! "let us understand one another. I'm here on business. You needn't impress me just at present, you can play afterwards." With a shriek the detective flung himself into an armchair. "Watson, Watson," he cried, "why are you never at home when these rude men come here?" He was so distressed that I felt quite uncomfortable, and tried to console him. At his request I fetched a bottle — which was labelled cocaine, but smelt like whisky — from the recesses of the coal scuttle, and the singular man drank a pint or more of it and said he felt better. Then I fetched his tobacco, clay pipe and sixshooter from a hatbox in the corner of the room, and he started to write his name in bullets on the wall. The fact that he was a very poor shot prevented the consummation of his wishes, and finally he threw the revolver into the fireplace and drank some more cocaine. Then he started to tell me his history, and I reproduce it in almost his own words. "I can't recollect when or where I was born, but my mother, who is now probably among the saints, was a gipsy, and my father, who is certainly among the sinners, was a low comedian. I started my professional career as a quickchange variety artist, and the experience I then acquired has served me well in my present work. I developed a liking for cocaine, a distaste for the commonplace, and a large bump of mendacity. So large did this latter become, that I left the stage and became an advertisement canvasser. From that the transition to my present position was rapid. Now, especially when I have taken plenty of whi — cocaine, I mean — I am a real, regular, rightdown, rampant, viceexterminating, blasé, cynical, callous, keenscented, readywitted, neverthwarted, demoniacal detective, with melodramatic effects. "Of course," he went on, "I am bound to confess I have benefited by the experience of a number of the Scotland Yard authorities, but that is only fair, for they lack imagination, and I have a great deal. I made their acquaintance in the olden days, when I used to bail out father. He was a delightfully impartial man, and didn't mind appearing all over the metropolis, professionally or otherwise, but generally otherwise." At this period of his discourse a specimen of the common or street organ (aurifractus vulgaris) stopped outside the house and started playing "Daddy wouldn't buy me a bow-wow." Instantly a flush of ecstatic joy lit up the detective's wan countenance. He had left the armchair and was sitting opposite to the fireplace with his feet on the mantelpiece. When the strains commenced he ceased talking, and with his long taper fingers beat time to the music, swaying his body to and fro the while. Unfortunately, such movements, though undeniably graceful, were fatal to his centre of gravity, and ere a moment had elapsed Sherlock fell heavily and painfully to the ground, where he shrieked for Dr. Watson. As no doctor seemed forthcoming, he took some more cocaine (?) and allowed me to lift him gently on to the sofa. "Awfully unfortunate," he moaned, "yet you see I must practice effect. When I first made Watson's acquaintance I couldn't do any of these things at all. He taught me when to look bored, when to yawn, and when to let my eyes light up with the fire of enthusiasm. When I had mastered all that, he taught me those bad manners of mine which are taken for the eccentricity of genius." "Let us get back to our conversation," I said, anxious to avoid these painful disclosures, "Have you ever failed in your work?" "Twice this year," said Holmes, "but Watson doesn't talk about it. The first time I failed was when I was commissioned to discover a raison d'être for the Imperial Institute. The second time was when I endeavoured to get value for money out of the exhibition of Earl's—"
At this moment someone knocked at the door. My back was turned to it, but I was shocked to see the sudden change on Holmes' face. He had been sitting on the sofa, his knees drawn up to his nose, that shocking black clay pipe protruding from his lips, and his eyes closed. He had looked like a shabby barn owl. Now all was changed. With a fearful cry, he collapsed and fell upon the floor. I turned round, and found myself face to face with a short stout gentleman, with spectacles on his face and a paper in his hand. "I've called for the water rate," he said, deprecatingly. "Hush!" I replied, "don't talk of such trifles. This poor fellow has a sudden seizure." With great kindness the old collector helped to pick up pieces of the detective, and then withdrew, saying he would call again some other time. Scarcely had he left the room when the sufferer opened one eye and winked at me with the other. "Don't be alarmed," he said, "it was only a feinting fit." "Admirably done," said I, amazed. "So was the collector," replied Holmes, blandly. "Pass me the cocaine." I did so. Then, without the slightest warning, the repeated applications of the drug (?) took effect. The dual nature of the man asserted itself. He stood erect, his eyes flashed fire, his hair stood up on end. "The train starts in another five minutes for the North Pole. Will you come?" he asked, excitedly. "Certainly not," I replied without hesitation. "Then YOU are the murderer!" he screamed, and threw himself upon me so suddenly that I lost my balance. In a moment his hands were busy at my windpipe, but, not waiting to strangle me properly, he endeavoured to reach his revolver. To do this he relaxed his grip. This gave me a chance. With an almost superhuman effort I threw him over and made for the door. I had it open before he reached his weapon. The first shot fortunately exhausted the last barrel and missed me by about two yards. Before he could load again I had vaulted over the staircase and was in the hall. The door was locked. With trembling hands I endeavoured to unfasten it, expecting every minute to be my last. Yet the maniac above did not attempt to follow me, and just as I had opened the door and was about to fly, a strange sound arrested me. The long quivering notes of a violin. The dual nature had evidently left him for awhile. Softly the strains floated upon the summer breeze. He had caught the air of "Daddy," etc., and I pictured the long thin fingers clutching the instrument, the bloodhound softened into the babe, the detective merged into the musician! The sudden change from storm to calm affected me. I dropped a tear and sped upon my way. This page was last edited on 29 September 2017, at 14:02.